But, I mean, just look at this. Can you blame me? Citrus has been ridiculously good this season. My gateway drug was the Cara Cara Orange Salad I made a few weeks back. I still can’t get over the vibrant pink-orange color of Cara Caras. 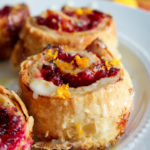 I thought I was being virtuous by putting them in a salad, but then I just started eating them all the time and subsequently dreaming up other ways I could use them (see, e.g., Cranberry Orange Breakfast Rolls). I feel like I’ve had about 5 colds in the past few months, so I think I’m justified in eating as many Vitamin-C-packed oranges as possible. The obsession wasn’t limited to oranges, though. Lemons have had their day in the sun with these Lemon Ricotta Pancakes and this Lemon Ricotta & Spinach Pasta. I guess you should add ricotta to my list of obsessions, too. Spoiler: the list is growing fast. If we’re being honest, it wasn’t small to begin with. 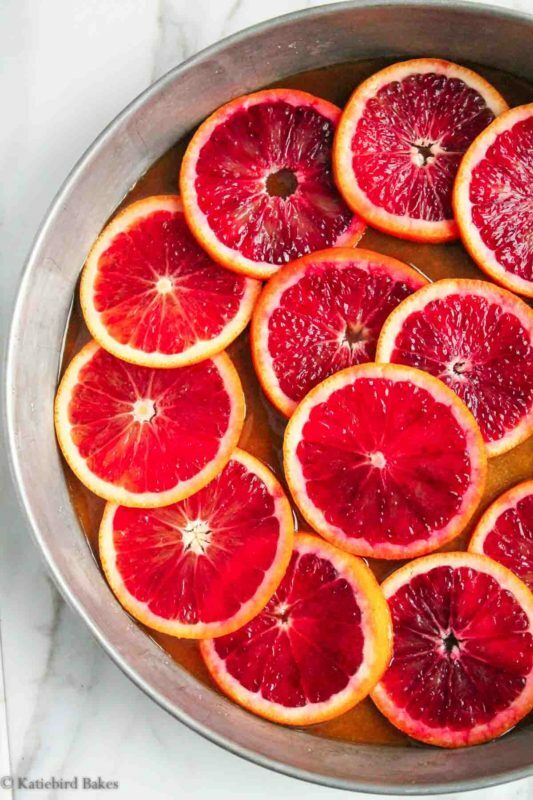 Blood oranges always steal the show with their amazing color. I actually find their natural flavor to be a little lacking compared to other oranges, which is why I prefer to eat them covered in butter and sugar. You don’t mind, right? When one thinks of upside-down cake, the first thing that comes to mind is pineapple. So it’s time for another confession: I do not like pineapple. At all. In fact, for most of my life I’ve refused to eat it, and will only eat it now to be polite. It’s something about the sweet/tart flavor combination that just rubs me the wrong way. I’m aware that I am in the minority here, and have learned to accept the shocked/horrified reactions I get. I do love the cake part of upside-down cake, though, so never fear. I found a lovely French yogurt cake recipe in Dorie Greenspan’s Baking cookbook, which is basically my favorite cookbook of all time (that’s not an exaggeration). If you haven’t read it, you’re really missing out. Not only is she a lovely person with wonderful stories about every recipe, but the woman is a genius baker and this cookbook contains every dessert recipe you could ever need. We’re going to make an upside-down version of her yogurt cake with olive oil today, which I hope she’ll approve of. I love when simple, humble ingredients come together to make something amazing. That’s what’s happening here. 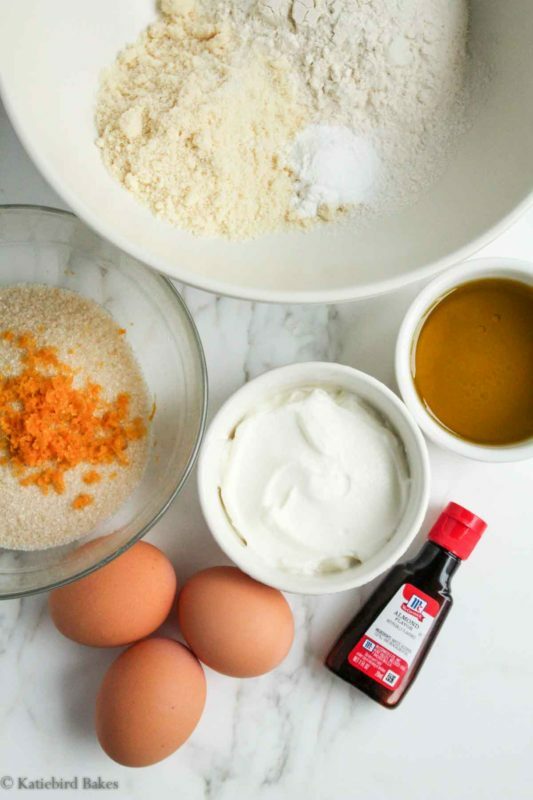 Yogurt, eggs, olive oil, flour, almond flour, almond extract. Almond + citrus = a match made in heaven. No mixer necessary here – just a whisk (or a fork) and a wooden spoon. 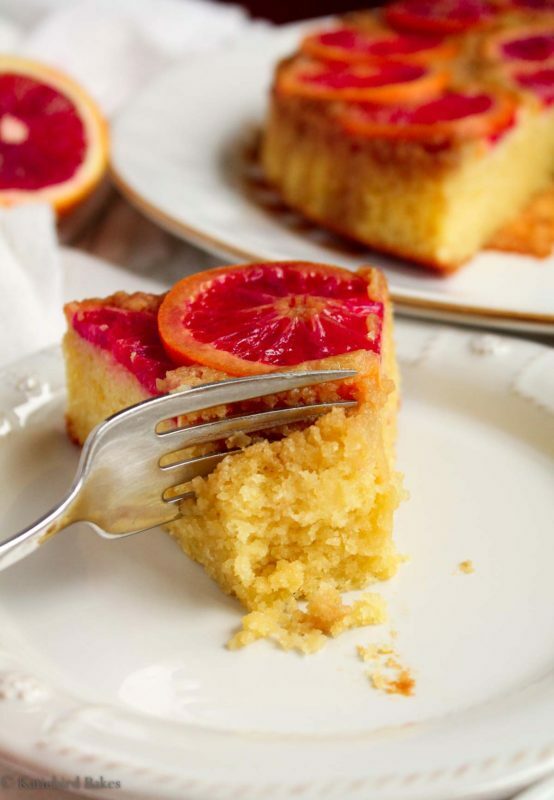 All you have to do for the upside-down part is melt some butter and brown sugar and put them in the bottom of a 9-inch cake pan, then arrange orange slices on top. I left the rinds on in these pictures because it looks pretty – they are edible after being baked, but the taste is slightly bitter, so I’d recommend removing the rinds if you’re concerned. See this post for a picture tutorial of how I remove my orange rinds. After you have your oranges arranged, pour the cake batter on top and smooth it out. Then bake, let cool, flip, and watch as magic comes out of your cake pan. OMG. Would you look at the glaze seeping into the cake? This is gonna be good. I wish I could send you the smell of this cake through the screen. It’s an almond-y, buttery, citrusy, homey, rainy day, you-can’t-be-sad-when-you-smell-this kind of smell. And the taste? Well. 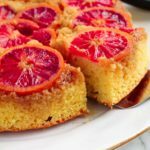 The olive oil/yogurt combination makes this cake supremely moist (I hate that word but there is no other word) and the almond flavor is just gentle enough to meld perfectly with the orange. It’s soft, it’s complex, and it’s heaven. 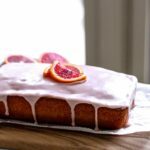 This is the kind of cake that you should keep out on your counter and snack on throughout the day, or make on a Thursday night with no occasion necessary. It’s humble, but mighty. I love the way you can see whole orange slices in each piece. I hope you love it too. We couldn’t stop eating it. 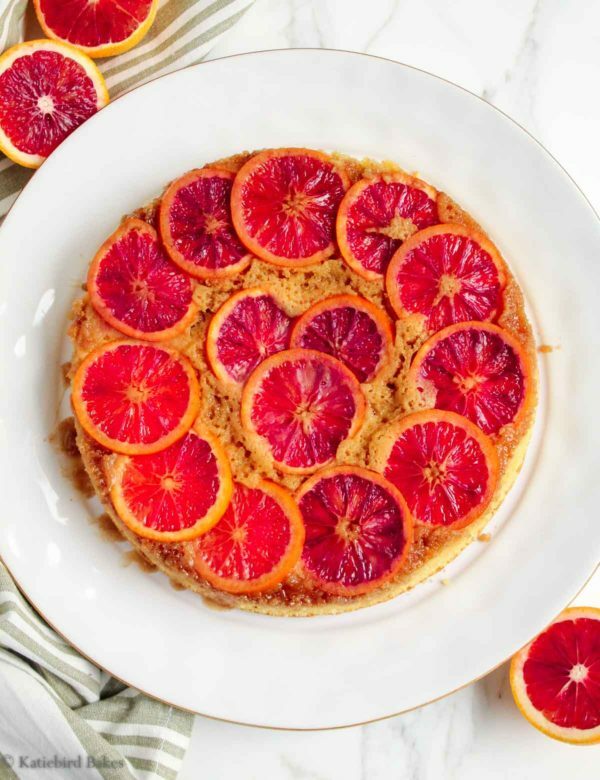 A simple yet vibrant blood orange upside-down cake made with yogurt, olive oil, and almond flour. In a microwave-safe bowl or a saucepan on the stove, melt the butter. Whisk in the sugar until it melts. 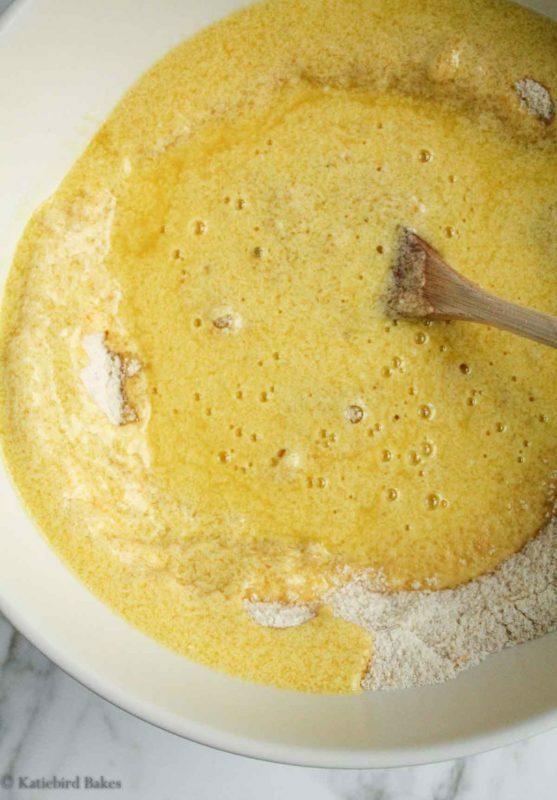 Pour the mixture into the bottom of a greased 9-inch round cake pan. Arrange the orange slices on top of the mixture, overlapping slightly, in a spiral pattern. You may wind up not using all the orange slices, depending on their size. Have a snack. 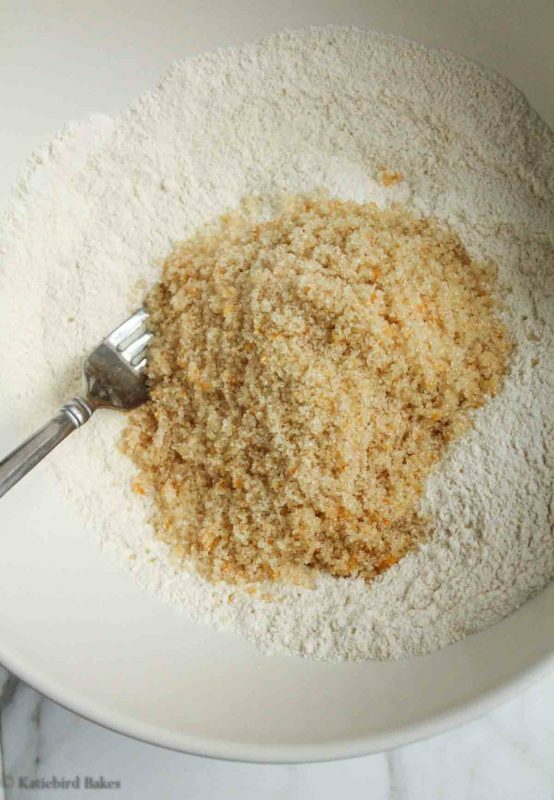 Preheat the oven to 350 degrees F. In a large bowl, whisk together the flour, almond flour, baking powder, and salt. In a medium bowl, place the sugar and orange zest and rub them together with your fingers until the sugar smells fragrantly orange. This releases the oils in the zest and flavors the cake. Add the yogurt, eggs, olive oil, and almond extract to the sugar and whisk vigorously until the mixture is very well blended. Whisk some more for good measure. 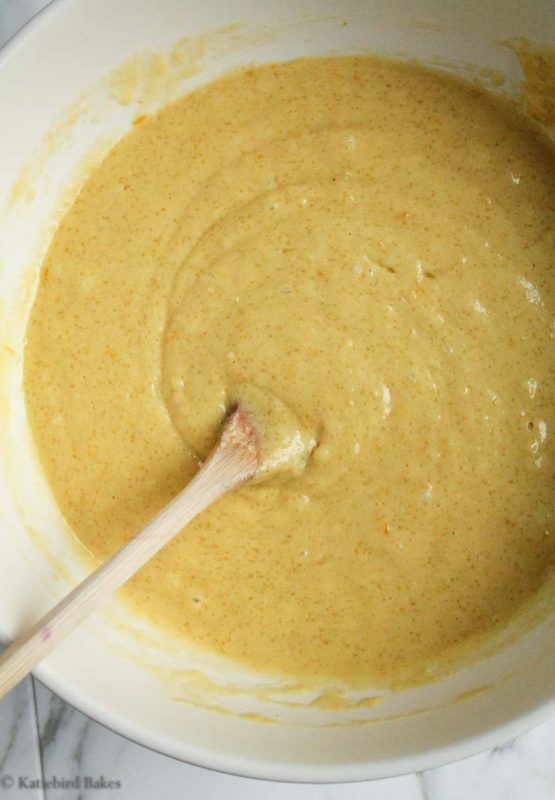 Add the dry ingredients, and fold and stir them in with a wooden spoon until fully blended and the batter is smooth and thick. 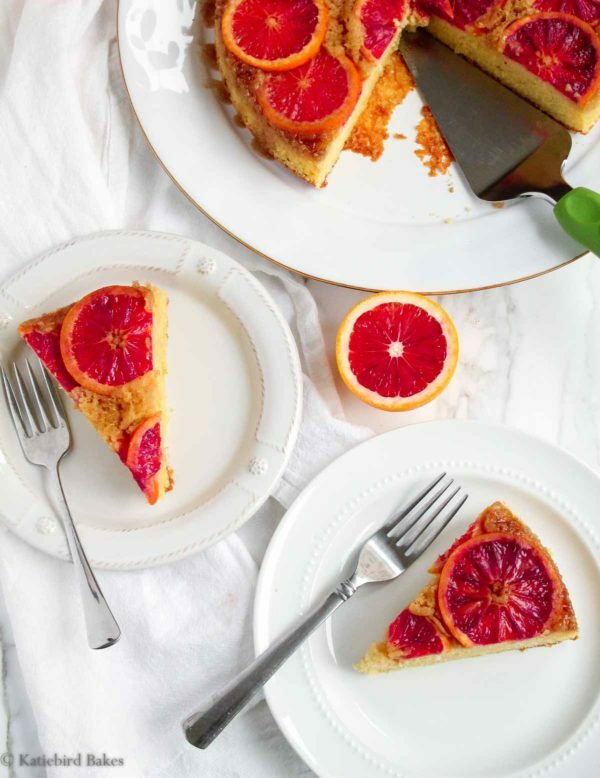 Pour the batter over the orange slices in the cake pan and bake for 35-40 minutes, or until the cake is golden brown and beginning to come away from the pan. A knife or toothpick inserted in the center should come out clean. Let the pan cool on a rack for 5 minutes, then run a knife or thin spatula around the edges of the cake. Place a large plate over the pan, then flip so the cake comes out upside-down onto the plate. Let cool to room temperature. Serve alone or with whipped cream. Cake will keep, well-wrapped at room temperature, for 3-4 days. 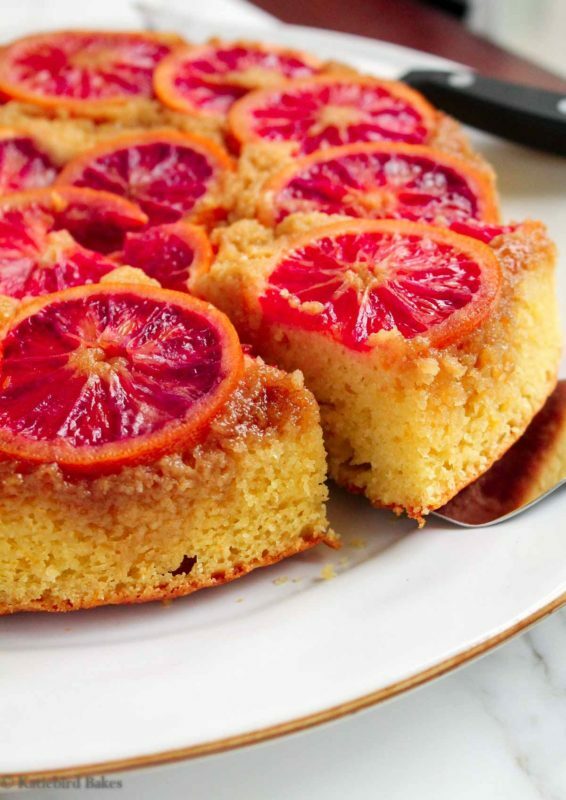 *I did not remove the orange rind when taking pictures of this cake because it's prettier that way, but the rinds impart a slightly bitter flavor, so I'd recommend removing them. Cake recipe adapted from Dorie Greenspan's French Yogurt Cake in Baking: From My Home to Yours. I shared this beautiful and wonderful cake with my FB friends. I have made marmalade, jelly, open tart with puff pastry, and given away many pounds of oranges. 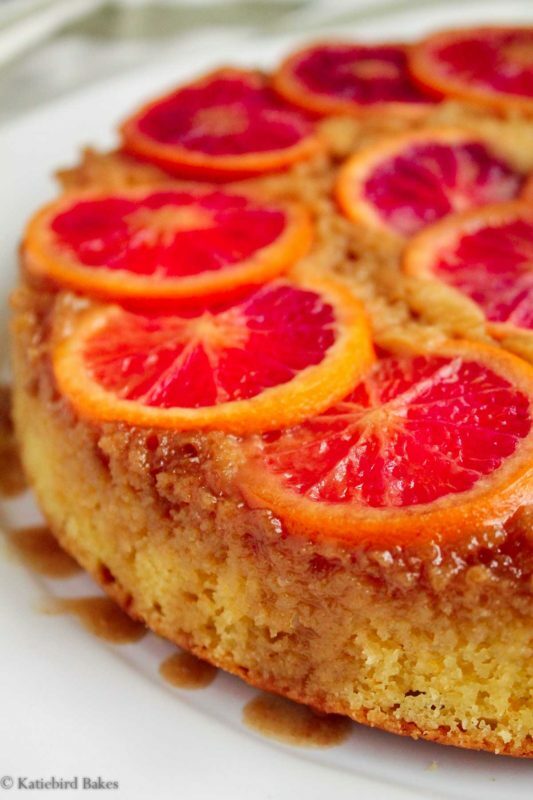 This year my tree runneth over with oranges and I am going to do this cake again. It was the best!! Also, made juice and more juice. Loved the recipe because so easy. Thank you so much for the great feedback, Winona! Baked it today and it is so, so good! 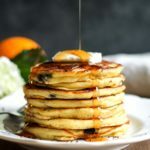 I am vegan so I made a lot of modifications- for example I used coconut milk instead of the yogurt, vegan butter, and a flax substitute for the eggs. Also, I decided to forgo the almond flour and just used all plain flour. My design did not come out as pretty as all of the blood orange pieces shifted when I added the batter. Maybe the rinds add structure? Didn’t matter though, it’s still amazing! i’m trying not to eat it all before my boyfriend comes home. Hi Sonia, thanks so much for the comment! Great to know that the recipe still works with vegan modifications. So glad you enjoyed! 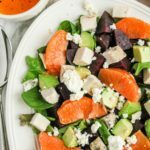 Just made this recipe and it turned out beautifully! I elected to peel the citrus fruits. 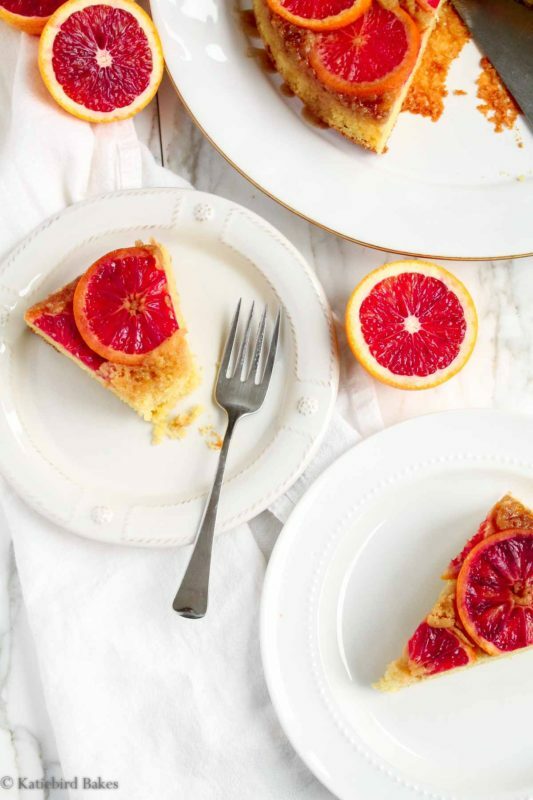 Instead of just blood orange, I also used grapefruit, lemon and regular orange to give it some flair! Pro tip – don’t use a springform pan…I did and some of the butter/sugar combo leaked out.